Here is a tasty pasta dish that is quick enough to serve for dinner on a weeknight. 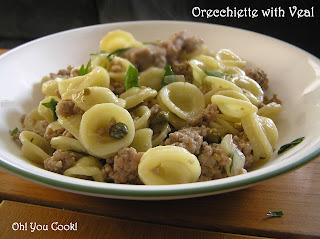 It uses orecchiette, which is a type of pasta, named for its resemblance to the shape of an ear. To me they more resemble tiny little bowls. I like how the little bowls ears cradle bits of the veal sauce. The little kid in me wants to pick up the little ears and scoop up bitefuls to pop into my mouth. Then the grown-up part shoves the little kid aside, reminding me that cooked orecchiette is too floppy to make a decent scoop and I'd wind up dropping veal sauce all over my lap and onto the floor. But I think a certain someone won't mind much. Fall is the time when the hot sticky weather from what seemed like a forever summer finally becomes crisp and cooler. Time for the leaves to descend from the safety of the tree branches and gently zig-zag to the ground, later to be picked up by a child and carried to school, or gathered in a pile for that same child later to jump into. 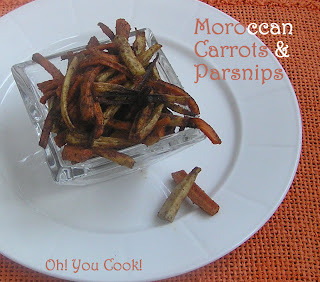 Fall is also the time when root vegetables are in season. So it is fitting that root vegetables were selected for this month's kosher linkup, brought to you courtesy of Jamie at joyofkosher.